Advanced operator training on the new TIMA-X automated mineralogy system at PKU. BRNO, Czech Republic - Dec. 10, 2018 - PRLog -- TESCAN is proud to announce that they have installed the first TIMA-X automated mineralogy system in China. The system was installed at the Geology Department at Peking University (PKU), Beijing. PKU is ranked number 30 in the prestigious QS World University Rankings, with the Geology Department consistently being ranked as the top geological institution in the nation. Scientists at PKU will use the TIMA-X system for research into fundamental geology. Their work will provide valuable insights into the origins of our planet and the life it has sustained. The addition of the TIMA-X to their instrumental arsenal will help them push for higher international rankings. The TESCAN TIMA-X is the world's most advanced automated mineralogy system. It is designed specifically for rapid quantitative analysis of geological, mineralogical, petrographic and metallurgical samples. The PKU system is a top of the line instrument based on a Field Emission Gun Scanning Electron Microscope (FEG-SEM) and four EDX detectors that seamlessly integrate with the software. As the top university geological department in a country with vast minerals wealth, the TIMA-X is suitably located at PKU. Under the guidance of Professor Zhang Bo, the TIMA-X will be used largely for postgraduate research as well as introducing undergraduate students to a technology which can have major benefits in many branches of geology. 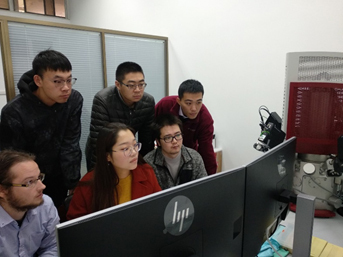 Prof. Zhang was excited to see how the TIMA-X could be applied to geological thin sections and was extremely positive about how it will be used for important research projects in the future. Following advanced training on operation and geological interpretation from TESCAN's resident geologist Jakub Výravský, Prof. Zhang's team of postgraduate students were very enthusiastic about how they could accelerate their own research projects with the new instrument. TESCAN's TIMA Business Development Manager Paul Gottlieb said, "The installation of a TIMA-X at the School of Earth and Space Sciences at Peking University is a major advance and takes TIMA-X technology to a new level for use in a wide range of fundamental applications in pure rather than applied geological research at a World ranking university. Their applications involve the integration of TIMA-X data with other geological data and procedures"
Professor Song Wenlei was also key to the TIMA-X acquisition. He has previously worked as a postdoc at Mendel University in Brno, (where TESCAN is located) and has collaborated with TESCAN on TIMA-X applications. As such he was very aware if the strengths and capabilities of the system. TESCAN is a leading manufacturer of SEM's and related instruments including Xenon plasma and gallium FIB-SEMS. They boast almost 2500 installations in more than 80 countries. For more information, please visit https://www.tescan.com.